Today my cheeky monkey got into the pantry and discovered the onions. After discovering they weren’t nearly as tasty as they look, she left a lovely trail of onion destruction behind her and moved on to greater things. Cheeky chicken. heehee! 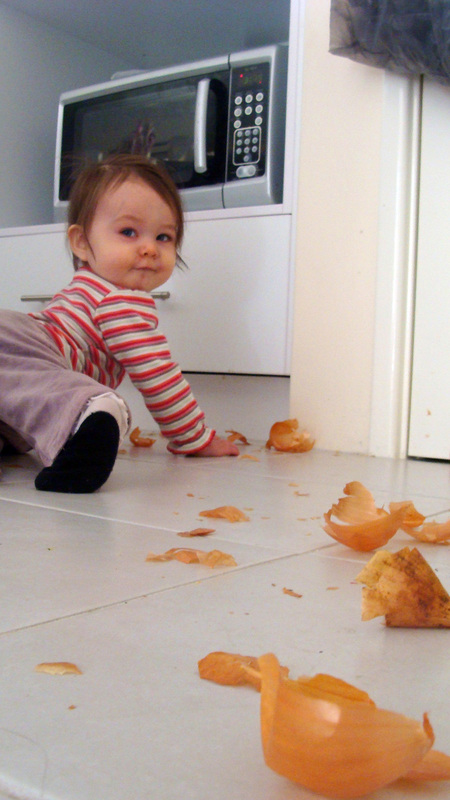 love that trail of onion skins – how hilarious! ugh i cant imagine biting into the raw onion but i bet she only tried it once! well glad she had fun exploring anway… im sure that low down microwave is also going to see a lot of action! Mmmm, yummy onion 😉 She looks like she had a lot of fun. Have you heard of a ‘treasure basket’? Great for children this age. It’s basically a basket full of natural items (include an onion if you like!) and is an antidote to all the plastic toys they are designed to go in babies mouths. Hey that’s a fantastic idea Tarnya, I hadn’t thought of it, I’m definitely going to do that!